Polish and Danish gas transmission system operators (TSOs) have launched the Open Season 2017 Procedure on the 6th of June, inviting all potential shippers to bid for capacity in the probable new gas pipeline from Norway to Denmark and Poland, the Baltic Pipe. The purpose is to collect long-term investment signals before final investment decision is taken by TSOs, GAZ-SYSTEM and Energinet. Phase 1: publishing Open Season 2017 Rules and other documents about the process, and allowing shippers to book for capacity until the 25th of July 2017. Phase 2 is expected to be launched on the 5th of September 2017 and will invite shippers to submit their final bids for capacity allocation by 24th of October 2017. The shippers that have submitted a bid in Phase 1 must also submit the same bid (or higher) in Phase 2 for the bid to be valid. If shippers book a sufficient amount of capacity during Phase 1, Energinet and GAZ-SYSTEM will introduce fast track implementation of the Baltic Pipe project. The Baltic Pipe is a strategic infrastructure project, with the goal of creating a new gas supply corridor in the European market. For the first time, it will be possible to transport gas from fields in Norway to the Danish and Polish markets, as well as to customers in the neighbouring countries. 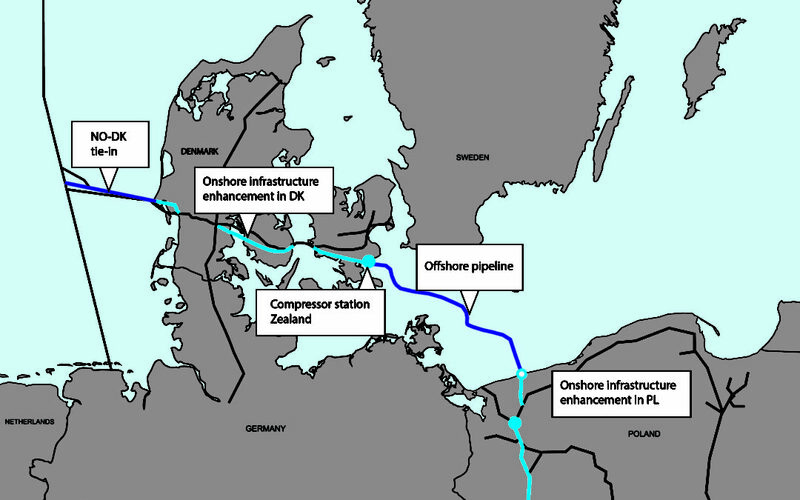 At the same time, the Baltic Pipe project will enable the supply of gas from Poland to the Danish and Swedish markets. Diversification of supplies through direct access to deposits of natural gas will significantly improve the energy security level. The Baltic Pipe project will make a significant contribution to the creation of an internal European energy market. The project is aligned with the objectives of the European Union's energy policy, such as increased competition, integration of gas markets, improved security of supply and effective implementation of sustainable development guidelines. The Baltic Pipe project was included in the first list of Projects of Common Interest (PCI), drawn up by the European Commission in 2013, and in the subsequent list adopted by the European Commission on the 18th of November 2015, underlining its regional importance. The Baltic Pipe project will also further strengthen the aims of the North-South Corridor concept and the Baltic Energy Market Interconnection Plan (BEMIP), important priorities for the European Union’s energy infrastructure development.